Check the in-store bakery rack for $1 off stickers. 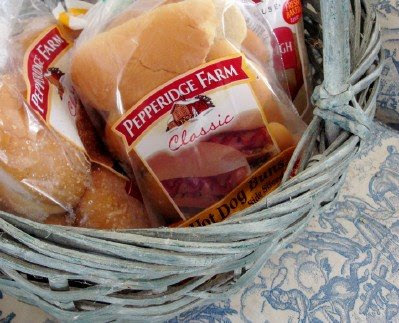 Stop by a Pepperidge Farm outlet for day-old bread. Watch for a grocery sale and freeze for the future. I'll be honest: for 50-cents a bag, I'm much more likely to buy Pepperidge Farm than switch on the breadmaker. But wait! Why would you buy stale bread? Is it moldy? I can almost always buy bread marked a couple of days before its sell-by date. A few hours earlier, it was sitting on the shelves at Publix. Check the tags to find the freshest bread. If you won't be using the bread within a few days, or if the bread is beyond its peak freshness, stick it in the freezer to prevent spoilage. How do you find a bakery thrift store? It depends on where you live. Pepperidge Farm, Sarah Lee, Flowers and other companies operate outlet stores in some areas. Ask around. You can also search the yellow pages under Thrift, Bakery. When distributors refill the grocery shelves, the older bread goes somewhere; if not to an outlet, then to a clearance shelf or another store. My Big Lots sells Arnold HFCS-free bread, for instance. I simply asked the man restocking the bread aisle if he knew of any day-old options nearby. How do I know if the bakery thrift store will have enough buns for my cookout? You'll have to plan ahead. Find out when new deliveries arrive. When you see the bread you like, buy a few bags extra for the freezer. Retail grocers are sneaky. When the ground beef is on sale, you'll spot full-price buns attractively stacked nearby, and vice versa. Stock up at the price YOU want to pay, and you'll never be bound by the sales cycle again. Would you share your bakery thrift stories in the comments below? Where did you find your outlet, how much do you pay, and how much do you purchase ahead? I found a bakery outlet a couple towns over (in North Hollywood, for locals) - about 15 minutes away. If I'm heading out that way anyway, it's great, although I haven't been there in a while. I usually buy enough to fill my downstairs freezer, and should probably make a trip soon. I can't remember what they're called, but they sell Oroweat & Entenmann's, all 1 to 3 days from their sell-by date. If you buy $6 worth, they give you a free loaf, if you buy $10 worth, they give you a free loaf & a free pastry (the free stuff expires that day). My local Dollar Tree sells Sunbeam hot dog and hamburger buns and Nature's Own 100% whole wheat, Honey Wheat, and Whitewheat breads. Yes, for $1.00 a loaf. At my local Walmart, you'd pay $2.66 for the 100% whole wheat. I stock up and freeze it, but I've never bought it less than 4 or 5 days before the sell by date there. Yes! Thank you so much for sharing your successes! I think a lot of people are scared off by the prospect of day-old bread, and these outlets are often hard to find. Also, I'd like to point out that i *don't* scour the city looking for day-old bread. I just keep my eyes open while I'm in the grocery anyway, and if I don't find anything that suits our needs, then I plan a stop by the bakery outlet. Our bread one closed, but I drive an hour to the Pepperidge Farm outlet everyonce in awhile just to stock up. It's worth the drive and then I buy a ton. Love this idea and I need to do it more often. We have one north of town, but I've never darkened the door step. not that I'm too good for a discount, but I only go up there for the plant store next door and something about dirt under my fingernails doesn't make me think of bread! Love the idea! Have to do it soon! We have a Hostess Outlet where we got to stock up on bread. The hard part is going in and coming out with just bread and not a cart full of Twinkies and Ding Dongs! Oh, and I don't take the kids when I go for that exact reason. Entenmanns outlet in Holiday Park. We buy up to 30 loves at a time to freeze. The bread is double wrapped and we toast our bread so it's all good.The outlet offers coupons so the loaves end up costing 1.11 (retail price is 4.00) plus we usually get two free items.My husband is on a first name basis with the ladies who work there. He calls ahead when he is in the area to find out if it's worth stopping that day. We have a great bread outlet (Merita bread-TN) just minutes from our house...it's actually in the same 4-block area with Walmart, Kroger & Target. It makes it very easy for me to stop by. The bread in this outlet does not have any later dates than the bread at my local supermarket, but the price is cut by at least half. I don't have to stock up & freeze since it is so close to me, but with 2 kiddos, it's just one more stop when I grocery shop, so I always get enough to last me a month. I love the small-store atmosphere, plus they have some freebies every so often (buy $7 worth, get free hamburger buns, etc). The only thing I have to watch out for is they have other bakery items (Hostess cupcakes, etc), but their prices are not much different. Not everything is a bargain there, usually just the bread. Ours is across town (and, in Atlanta, "across town" is 45 minutes away--LOL), but it's near my husband's office. Occasionally, if we're over there, or if I can convince him, we'll get there, and then I stock up. We used to have one closer, and I dearly miss it. No bread outlet here, but we've found very good deals on the clearance table by shopping at off-times--Friday night or late in the day on Saturday, for example. We don't usually do our main shopping at those times, but if we happen to be near the supermarket anyway sometimes we'll drop in and look. Last night I found several packages of kaiser buns for half price, which is nice because we're planning to bbq burgers this weekend anyway. But usually we freeze whatever we find. I L-O-V-E my bakery outlet! Not only do they have bread and such, but they also have chips, pretzels and popcorn. I haven't bought any snacks for more than $1 a bag for a very long time. And they've always got the craziest flavors for those who like trying something new. They also have those boboli pizza crusts for very cheap for those nights when you don't even feel like making crust. We have one but it's on the other side of town and their best deals are on Wednesday, when I'm working. However, we have a new Little Debbie outlet on a regular path that I take while working (on the way to another town) that I need to stop in and check out! Thanks for the inspiration, I'm going to make it a goal for this week. We have a party coming up for which we will be grilling. I'd like to save some money! We have a sara lee one in our town and a bunny bread one because it is a local company. The sara lee use to be the best around. But you can see signs of the times right now because when I go it is slim pickins a lot. Use to be you could pretty much pick up any kind of bread you needed at very low prices. Now you have to hit them right to get the best stock. They also are great about giving bread away if you purchase anything. Many times they will put a few extra in my bag because they would just be throwing it away anyway. I have never had problem with mold. (with 7 kids we eat it pretty fast anyway) I freeze all extras and just let thaw on the counter and it is never soggy. The Best SECRET around!!!! LOVE you're Blog, never commented. I live in a fairly small rural area in the mountains of Southwest Virginia. We have two bread outlets. One is Marita and the other Kern's. I prefer Kern's. It is 10 minutes from my house and my husband is by there several times a week. We get six, two pound loaves a week. On Monday, Wednesday, and Friday he picks up 2 loaves. They are a dollar each. HD and HB buns are also $1 for packs of twelve. They also have beagles, texas toast, and speciality breads for $1. Also they have footlong HD buns sometimes. A real treat for the hubby and kids!!! I like to buy a loaf of texas toast and make up my own garlic butter spread, flash freeze, then re-package. It works just as well as the expensive boxed garlic bread when we have speghetti or lasagna. And you can use as much as you need. Also several times a week they offer "flats"(3dozen) of either large seeded HB buns or 6inch sub rolls. As you can tell I love the bread store!! I have added up our weekly savings to be on average $20-$25. I have two teenagers and we usually have many of their friends here and we all know how that age group can eat. For any New England readers, I purchase organic, preservative-free When Pigs Fly sourdough and Matthew's Bread, (both pushing $4 a loaf in groceries) for under $1.50 at HalfPenny's in Epsom. Sometimes there is even spelt bread available! PigsFly is in the freezer, not on the shelf. Vermont Koffee Kup Krullers for .75 a package (cost $3 at the grocery). PigsFly is not always available but everything else is. I freeze 2-3 loaves of whatever flavors available, removing 1/4 of each loaf to the fridge for variety in the week's menu. HalfPenny's sells other non-produce items, bread deliveries are on tuesdays. Shaw's grocery does the best mark-downs on day-old burger buns, etc. After big grilling holidays, sometimes as low as .39/PKG. Another thought: Check your local churches! a FREE or reduced cost grocery minsitry in the church gymnasium, not a food bank. Over-runs from local groceries, meat (frozen by the grocery so no possibility of spoilage in transit) at greatly reduced prices (meat purchases ARE limited, you have to take tickets). We have used this ministry occasionally and watched SO MUCH day-old bread put in the dumpster at the end of the morning simply because people can't take it all! All the brand-name bakery products: Freihofer, Arnolds,and also artisanal. Frosted unsold bakery cakes. My friend and I have also hauled off grungy produce slated for their dumpster to use in our compost piles. We used to have a Hostess bakery outlet near my home in Ohio and I always stocked the freezer with buns and bread (great for making stuffing at the holidays too) and granola bars and the occasional angel food cake for a treat. We have a bakery thrift store across the street from the local bakery. Another customer saw me purchasing a cart full of bread one day and told me all the bread in the store is $.99 on Saturday. Wasn't that nice of him? I love the bread store! It is now a weekly stop. Our Sara Lee store has a shelf for .50 bread and I can always find loaves with the date still a week out. We also have a Butternut shop that I'm checking out this week. I posted last week that they offer free snack cakes and a loaf for bread for good grades. I'm hoping they have more variety than the Sara Lee shop. I have never liked buns that have been frozen and whenever I freeze them I always end up throwing them away. How do you wrap them before freezing? I think that is my problem - when I just put them in the freezer in the package they come in. I would love to know the secret of how to wrap buns for the freezer so that they don't get ice crystals in the bag. Wrapping the buns individually in press 'n seal (or some other wrap) and putting them back in the bag seems like too much work but might solve the problem. I would love any advice on how you do it so they are ok when thawed. LOVE the Oroweat store! Haven't ventured over there since we moved to a new town. But, thanks for the great reminder! We have been going to a bakery outlet for a couple years and it does save us lots of $. We also get flats of bread for our chickens and pigs to supplement their feed. I used to go to our Pepperidge Farm outlet all them, but they closed about 6 months ago. It was a sad day when that store closed. Even my four year old son loved going there. Whenever we go past the closed up shop he always asks why they closed. I can't for the life of me figure it out either. They were always packed and had the best bread and best deals. We have another bread outlet but the few times I've stopped there their shelves were mostly bare. Maybe I just always pick the wrong days? Aldi. Aldi sells buns for $.88. I've never been able consistently to beat that. 'Course, I liked it better way back when the buns were .$29, but those days are gone forever. . .
We don't have a bakery thrift store anywhere near our rural area, and the ones that are in the large town an hour away are all located in BAD neighborhoods, and I am not too keen on taking all 5 kids into some of those neighborhoods. (Lots of shootings and murders!) One of your commenters mentioned that buns seem kind of yucky after they have been frozen. We had a lady from our church bring us a meal after our last child was born and brought us buns that we could tell had been both marked down and frozen for probably a long time. They were so nasty and gross that it REALLY turned us off to anything like that. But that's silly, isn't it, because we freeze bread all the time and don't have any problem with that! For us, we have found that Aldi's is cheap and almost always fresh. We also would recommend Sam's Club. I bought a large pack of 16 hamburger buns last night for a little over $2.00 (I think something like $2.27). They were very fresh, and I am sure that they would freeze wonderfully. So just another idea for those who may live in areas where Bakery thrift stores are not readily available! Thought I would post this as we are talking about bread. 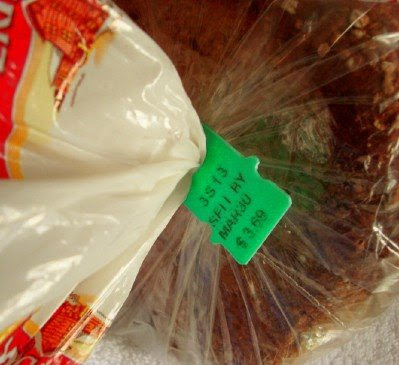 Did you ever notice the colored tags on the bread packages? This is what I found out. I guess this sytem helps not only the concumer but also the stocker who stocks the bread to disscard the older bread to ship to the outlets or whever their next life is. My nearest outlet is pretty far away.And I have never foze bread before as someone said it tasted strange after it defrosts. We have a Rainbo bread store (Manhattan, KS) nearby that I frequent, however, now that I think about it, it's beena long time since the last trip. Must change that. What's available changes with each trip. I tend to buy a lot when I go though so I can fill my freezer. Definitely worth the effort for the savings. I haven't purchased buns since I found this recipe. It's very simple once you have done it once, tastes way better than store bought, and only needs about 20 minutes prep time, not counting the rise time, which is only 30 minutes, and 10 minutes in the oven. I just start them before I start the meat. Also, making my own allows me to control sizes. So I can make little sliders for the kids who won't eat a full burger, and can shape the patties in to reasonable healthy sized portions with only a few gigantic man burgers for the guys who will need them. It leads to less food being wasted and makes it all stretch farther. To make it even more cost effective, I add 1/3 cup powdered milk to the dry ingredients and 1 1/2 cups water total instead of of the cup of milk. There's a Mrs. Baird's outlet not far from my house. I can usually buy bread that's 2-3 days away from it's sell-by date for about $1.19/loaf. Same with hamburger or hotdog buns. Because it's just the 2 of us, I don't usually buy our sandwich bread there, as we can't eat it fast enough. But if we're grilling for a group, I always go there for buns. I also like that I can get my favorite super-thin tortilla chips there for much less than the grocery store. They sell some other really good stuff like Bob's Red Mill hot cereals. It's definitely a good place to go. Our local bread brand here is called Schwebels- I would never pay full price for bread at the grocery store- I always shope the bread outlet! BTW- I don't like the taste of frozen bread either- it tastes stale to me- so I don't stock up. But we don't go through a lot of bread. BTW, I tagged you for an award...please, please, please don't feel any need to post it (I rarely ever do! )- I just wanted you to know! I found my Old Home Bakery Outlet about 8 months ago and have not bought bread at the store since. I can buy bread for 50% or more off what the store charges. I usually buy 6-10 loaves (depending on the freezer room I have available) and stick them in the freezer. Last time I went I walked in and they had Earth Grains bread for $1 a loaf. At the store this is $3 or more. I bought all 8 loaves. I love bread outlet stores. Oh, I loved the bakery outlet in my former town. It's been so long, I don't even remember prices. There is a bakery outlet in my current town, but it's really out of the way for my usual trips out. Although, I did drive by today, and didn't stop! It just didn't occur to me. I *do* shop on "clearance day" at my regular grocer. I get occasional bread that way, although usually the specialty stuff like sourdough. As a semi-related side note, last night I made meatloaf with a 79 cent package of... dry french bread. The store slices it and dries it for "stuffing" and then clearances it. I zapped it with my 3-cup processor (in batches, of course... 3 cups cubed=1/2 cup crumbs), and had probably five cups of bread crumbs! I've never noticed much taste difference on frozen bread/buns--probably because ours rarely last longer than 2-4 weeks. However, we usually toast our buns on the grill as the meat is cooking. They taste great that way! Also, it's mostly the kids in our house who eat sandwich bread, and of course, they are not as picky as adults. I bought English Muffins at the Dollar Tree this morning (for$1), which expire on April 3. Great deal! They also have lots of Pumpernickel bread, hot dog and hamburger buns, etc. which I have bought in the past. Not all Dollar Trees in this area are as big, thus they don't all have bread like this. Our local Giant marks bakery things down, yet the price is still not "that" good. The only thing that they mark down to a good price is bananas. (19 cents a lb.) So I always look for the brown bags of them to eat within a day or two, or throw in the freezer to make Banana Bread. We have two Freighoffers (spelling?) outlets nearby, so I usually frequent them. I can get my daughter's favorite 100-percent whole wheat bread for about $1.39 a loaf (it's at least $2.50 at the local grocer), English muffins for $1 a pack, bagels for $1.30 a pack, etc. Also, they have frequent shopper cards: for every $10 spent you get a stamp. When the card is filled, you get $5 off your next purchase. In January, they pass out calendars with monthly coupons (free bread, BOGO free offer, etc.) I can get a lot of stuff for $10 and I definitely stock up my freezer when I go. In NC we have alot of Merita bread outlets. Sometimes it is cheaper, sometimes not. Depends on what you are going in for. 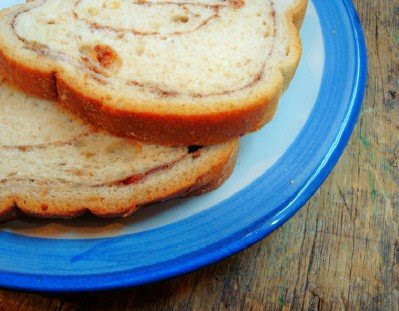 Many of the specialty breads (like cinnamon raisin bread for toast) is nearly the same price as the grocery store. But buns and reg. sandwich bread are usually a good deal. But be prepared to pay in cash; the merita stores only take cash and no debit. I don't know if this is across the board, but the Dollar Tree store gets bread from Sara Lee (ex. date is still 3-7 days out). WW bread, bagels, cinnamon bread, ham/hotdog buns. All for a dollar. Worth checking into. I wish I could find a good bakery outlet around here. The only one in our town wants more than the regular price at my Wal-Mart. Maybe it's the Hostess/Wonder outlets in general?? We have two in our city - one is Mrs. Bairds and another is a generic one. I have had more luck at the generic one than Mrs. Bairds. Plus if you buy $5.00 worth of products you get another loaf for free! We only buy Nature's Own bread (I'm snobby like that ;)), and you are right I can get my bread there for $1.29 (or 2/$2.00) a loaf compared to my grocery chains $2.89. We also get sandwich buns instead of hamburger buns, hot dog buns, hoagie rolls, and other oddities plus our free loaf. I'm not sure what is going on but I suspect it is the economy, but here of late they have been low on several items. I'm blessed that we have one of these because the major local grocery store donates ALL of it's expired goods to the food pantry. I LOVE our bakery thrift store! We have one right up the street. I don't know what this family of 12 would do without it. As a mom with a child who has a peanut and soy allergy, bread is a hard food to purchase. Bread most often contains Soy Flour, which is what we need to avoid. The one bread that is fine for my son is Pepperidge Farm Thin Slice Whole Wheat. It is very difficult to find, but when my food market has it stocked, I purchase a few loaves and freeze. I have been successful freezing bread up until recently when I pulled out a loaf from the freezer and a couple of days later, it had mold in the middle slices. The bread keeps in the freezer for no longer than a few weeks. Is there a trick to freezing bread? You won't believe what story I am working on...sigh! We need to talk more ;) I love it- such great advice, Meredith! Our bakery outlet went up considerably in price so I stopped shopping there. I think I need to swing by though and see if the prices have dropped since gas prices went back down. It was no longer an affordable choice. deals. I have a big lots about 45 min. away and a dollar tree also. In Grand Rapids, Michigan, there are Aunt Millie's bread stores all over the city. I can get organic whole wheat that would usually top $4 in a store for just over a dollar. Woo hoo! those were the days - mmmmm. I notice too they sell crackers/chips/mic popcorn/candy/ and even refrigerated fresh uncooked pizza! lol! Yes! Latrice, you're absolutely right. I wish I could fit a deep freeze in my house somewhere. We used to go to a Hostess/Wonder outlet when we first married. You could buy Hostess cupcakes, etc 10 for $1 on some days, and we used to joke that we'd have those for our future kids' birthday parties. I think now they are priced 69-cents each there, or 2/$1 if you're lucky. ALL over this tip, we have been doing it for years! Great Post! We have no such a thing in Australia. Supermarkets mark down today's bread at the end of their shopping hours (ie around 8pm, two hours before closing). However, our prices are vastly different to yours and Aussie big business supermarkets are not so generous. It's always a better deal to switch on the breadmaker here. And healthier. I know what I put in my bread ~ it has no 'numbers' in the ingredients.